Residents help a mate walk through a flooded road in the floods that ravaged Kasese in 2017. 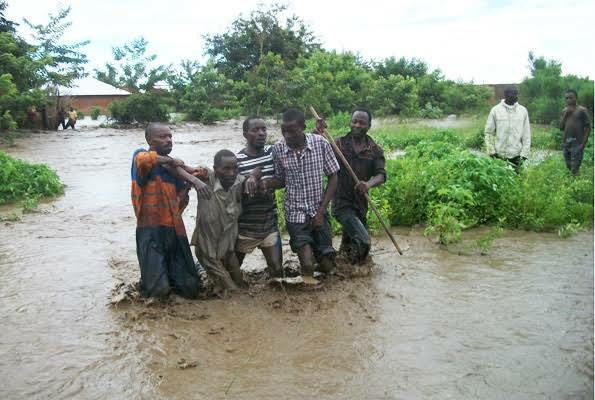 Hardly a year after floods hit Kasese District, displacing over 1,500 people, fresh floods have hit the district again, displacing over 300 residents in Karusandara Sub-county. This is after River Sebwe on the lower side of the Kasese–Fort Portal highway burst its banks, forcing water into homes in Sebwe, Kivengyenyi, Kabaka, Kabuga and Omugando villages. According to the sub-county chief, Mr Christopher Kalyamubiri, people are suffering and appealed to government for help re-channel the water to the river. “We appeal to the district and other well-wishers to come to our rescue and save the situation; otherwise, we are unable as a sub-county and our people are suffering,” he said. Mr Gideon Ntabose, the district vice chairperson, said Karusandara is the most affected whenever floods hit the district. The sub-county is located on the slopes of Rwenzori Mountains and suffers severe flooding whenever it rains heavily in the mountains. The area councillor, Mr Santos Tumwine, said plantations of maize, coffee, banana, beans were also destroyed by floods and called for the district intervention, adding that more destruction will be felt as rain continue up in the mountains. “We (village mates) have lost our crops to water. We had reached the harvest season but now beans are gone, maize and banana, we are badly off as I speak, we are trying to look for some food but it is not easy, we need help from government,” he said. Kasese has been hit by floods every year since 2010, leading to loss of lives and property, but the magnitude of the damage has escalated since May 1, 2013. Since 2013, rivers Nyamwamba, Mubuku, Sebwe, Rwimi, Nyamugasani, Kitakena and Maliba in Kasese have burst their banks and destroyed human life, property, infrastructure, crops and livestock. The rivers flooded on May 1, 2013, May 8, 2014, May 7, 2015 and July 1, 2015. One of the key causes of the flooding is the silting of the rivers. However, no deliberate effort has been made by government to de-silt the rivers. People living on the slopes of the mountain practice poor farming methods, which cause soil erosion and landslides that silt the rivers, causing flooding. Deforestation is another major problem facing the mountain ranges.